If you need a space to for your Christmas presents then you should check out this Cyberman Christmas Stocking. 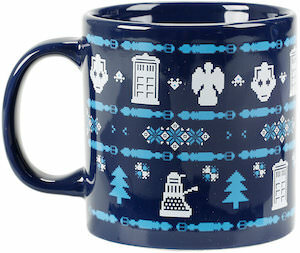 A Doctor Who fan already knows that the Cybermen and villains that like to deleted humans but still they are cool and that is a good reason for checking out this Doctor Who stocking. 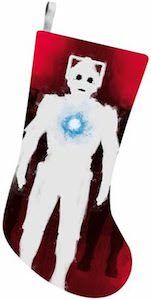 The Christmas stocking is red with on it in white a big Cyberman with a blue glow on his chest making it look just like what you are used to only not in shiny chrome. And this is a 19 inch Christmas stocking that will look great in between the other stockings in your home and when having a stocking like this maybe Santa will bring you Doctor Who presents. Now there is a shredded Cyberman t-shirt for all the true Doctor Who fans. The Doctor Who t-shirt is made from a cotton and polyester blend and comes in men’s sizes Small – 2XL and will look fun on women too. The shirt sows a image of a Cyberman and the images seems to be made from shredded piece of the image. As you can see the whole design looks amazing and that is why any true Doctor Who fan need to have one so that they are ready when they have a day they like to deleted everyone around them. If you like Doctor Who and building things then you should check out this Cyberman 3D metal model. 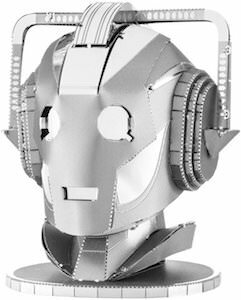 The model kit just needs to be assembled and that means that you may need some tools as metal is pretty sharp but when done you will have a nice Cyberman bust that you can place in your home so that everyone knows the you prefer to delete things. So while waiting for new episodes from Doctor Who you can start working on this Cyberman model and when done people will look amazed as it looks so cool and you can build it. 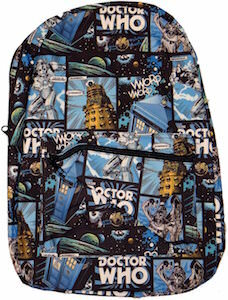 Now there are Doctor Who leggings that show sketches of the Tardis and villains and it covers the complete fabric. These Doctor Who leggings are made from 95% cotton and 5% spandex and it has a stretch and they are blue. 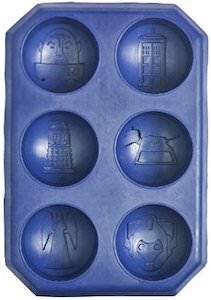 On the blue fabric, you will find sketches of gears, Dalek, Cybermen, and the Tardis. These women’s leggings are available in a wide range of sizes from a junior XSmall to a plus size 6 and that means many true fans of the Doctor can now have the cool pair of leggings they deserve and will enjoy wearing. 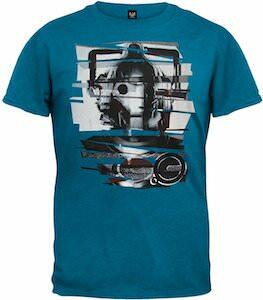 This is a Cyberman t-shirt for all the women out there that would like a Doctor Who villain on their shirt. The light grey t-shirt shows the head of a Cyberman in a burgundy red color and if you look closely you can see that in the face of this creature there are many more Cybermen so it’s a shirt with more then one of the Doctor Who villain that likes to delete people. 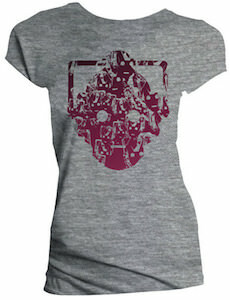 You can get this Cyberman t-shirt in women’s sizes Small – XL and it will be one of those t-shirt you will love to wear.